In 1992, the village built itself a grand school with its own funds and labour. Today 850 boys and girls study in it, only 650 of them Ralegan children. 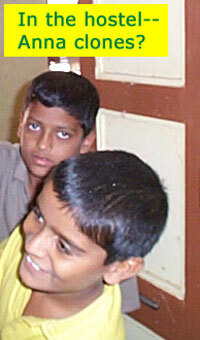 In the boys' hostel are 250 kids from all over Maharashtra. To be eligible they need to be drop-outs; if they have failed in their studies their chances of admission are better. Yet, over 90% of the children pass high school. The school has science laboratories, computer courses and a big library. There's a retired army sergeant who drills fitness into them. Kids rise at 5.30 am for a shrieking, mass run through the village. The school has vast play grounds. Children run a nursery, and actively plant and care for trees. Girls are taught to swim, to ride bicycles and lately bikes. Anna believes that development in society isn't possible without women playing an active part. Main media knows Anna mostly as an agitator. He is a good one too. He will fight for the village's right to every sanctioned scheme. Villagers will not pay a bribe. They will collar and expose any bribe seeker. Anna's reputation is such that the Government trembles when he demands action and transparency. [Read this story.] Awards and cash have come his way. All the prize money -- over Rs.19 lakhs-- has gone into running his Vivekananda Trust, that awards an annual cash prize of Rs.25,000 to a village level leader. Ralegan has become a legend. There's a steady stream of politicians and leaders who come to see for themselves. Buses drone in constantly bringing villagers. Some on day trips, and some for weeks long courses. There is a formal Training Centre. When he is in town --which is rarely, these days-- he will receive and talk to anyone, sharing his ideas and vision. We are in luck. He is 'in'. He is a short, compact man with an earnest face. He sits cross legged on the floor and has all the time for you. His simplicity and readiness are slightly unnerving. You expected a greater reserve from a man who is widely venerated. Soon you know why he lacks it. "As long as there is 'my' and 'mine', there is sadness," he says. "When you define your family in narrow terms, the contrasts within it and without will be stark. So there will be sadness. But as soon as you define 'family' in inclusive, wide terms all sadness disappears." Why is this emphasis on not consuming liquor, tobacco or meat? Doesn't it amount to coercing people? "You can begin where you want in development," he says. "But at some point or the other you have to address these issues. They come in the way. They are connected with issues of health, economics, education, responsibility and family harmony. In Ralegan we got them out of the way quite early. Others will have to get them out of the way later, if they envy Ralegan and want to emulate it."